Full-HD video playback and navigation - up to 1080p - This is the real thing; Full-HD 1080p playback. Sit back and enjoy the spectacular picture quality of brilliant high definition video and the crystal-clear sound of digital audio. Use the included remote control to make your entertainment choices using our crisp, animated navigation menus. Play network and internet content. Connect to Internet sites like YouTube, Flickr, Live365 or stream content from your home network. Experience spectacular Full-HD video and crystal-clear digital audio. Supports a wide variety of the most popular file formats. No need to spend time transcoding. HD video, photos and music -- they're on your computer, your USB drives, and the Internet. 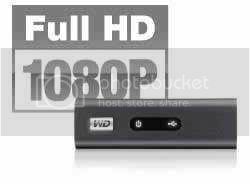 Now it's easy to play a whole world of Full-HD, 1080p media on your TV with the WD TV Live HD network-ready media player. Play a wide variety of file formats - WD TV Live supports a wide variety of the most popular file formats. No need to spend time transcoding. Play videos, music and photos from the Internet on your big screen TV - Explore and watch YouTube videos and Flickr pictures on the big screen. Rock out to thousands of radio stations via Live365 and discover new music with Pandora radio. 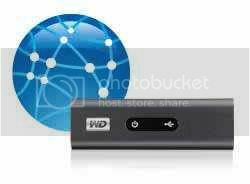 Access media files on your home network - The Ethernet port lets you connect this player to your home network through a wired connection or an optional wireless connection. WiFi Ready - Supports wireless network connection with optional USB wireless adapter. Click here to view compatible wireless-ready USB adapters. Turn your USB drive into an HD media player - Play content from most popular USB drives, and digital cameras, camcorders, and portable media players that can be recognized as mass storage devices. Optimized for My Passport portable hard drives. Collect without limits - There's no limit to the size of your media collection; just add more USB drives for more space. Play media seamlessly from multiple USB drives - Two USB ports on the player let you connect multiple USB storage devices and access them simultaneously. Our media library feature collects the content on all the drives into one list sorted by media type. Transfer files easily - Copy, move or delete files stored on a USB drive, a network drive, your camcorder, or a camera to the attached USB drive using the on-screen menus. Show photos and movies directly from your digital camera or video camera - Works with digital cameras, digital video cameras, in fact, any digital imaging device that supports Picture Transfer Protocol. Thumbnail and list views - Browse your content by filename or by thumbnails of photos, album covers and movie cover art. Media library - This unique feature lets you view all your media by media type in one menu regardless of its location in folders or drives. You can view your content by categories such as genre, album, artist and date. Search - Search by genre, title, artist, filename or partial filename. Search by filename, partial filename, most recently viewed and date. HDMI 1.3, composite video and component video output - The HDMI port lets you connect to the highest quality HDTV or home theater. Additional composite (RCA), and component outputs ensure compatibility with virtually all television sets. SPDIF digital output - The optical audio output sends digital signalss to your AV receiver for the best surroundsound experience. My Passport portable hard drive or other USB storage device with supported video or audio content stored on it. Home Network and broadband connectivity for online services.